Although I stayed in London for over two years and nine months, I decided to leave the UK because I could not re-extend my student's stay permit, and I could almost accomplish my goals in studying abroad. When I was telling friends about my plans to go study and work in the United States of America (USA) and then return back to Japan, some of my friends recommended me to visit the address of their friends living in the USA. James L. Hildebrand, the print director who collected my works in London, gave me a list of American print galleries; but, after receiving this list, I found out that there would be a few unexpected events that would develop in time that I had not expected. On September 22, 1979, I arrived in JFK airport of New York after leaving London Gatwick Airport. My visit to Manhattan in early autumn, for my first time, I spied a very modern and rich city with skyscrapers that ruptured the heavens; and this filled me with a feeling of great awe. The subway trains were filled with graffiti, as I had seen on TV, and I felt a heavy tension was drifting at the station, and I was scared. For a while I wandered around the valleys of Manhattan's cities/towns and took pictures and spent a wonderful time at the museums. When I was working at the Print Workshop in 1977, there was a visitor to Birgit, that person was Dan Welden, a lithograph printer from New York. He told me that when you returned to Japan, I hope that you will be able to drop in to New York sometime, and handed me a note with his address. This fateful encounter was the beginning of a long relationship. I checked his address, and I found that he lived in Long Island next to Manhattan. I got to Deer Park Station on a train of Long Island Railway from the 34th street Penn Station, which took about 40 minutes to ride. Dan and his wife, Shirley, welcomed me and I stayed for two weeks while playing with two children. I went to Manhattan every day from there, and I looked for a gallery that handles my works, taking the work of “Nature Morte” with me in hand. The first gallery in the Hildebrand list was the Fitch-Febvrel Gallery on 57th street, dealing with monochrome works such as the French engraver Philipp Mohlitz, and etcher Eric Desázieres, who were famous at the time. Andrew Fitch, who I met for the first time, gazed at my work with sharp eyes and said to me, "Comeback someday!" Although I thought that it was useless to refuse because I was only making small works, when he saw me a little disappointed, Mr. Fitch made a telephone call to Martin Sumers Graphics, that was run by his friend, and he give me a note and he instructed me to go there. He was expanding the possibilities by offering warm support to a young artist. Even if it might be useless, I was very grateful that I could go to next place. Like Bob Dylan was fondly singing, “Old New York is a friendly old town,” but at that time New York was also a friendly city. 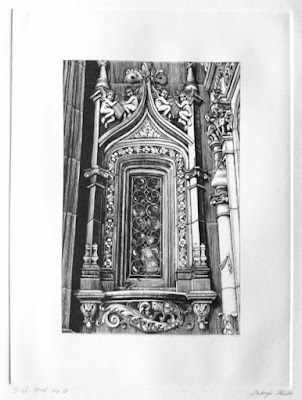 When I went to the gallery as instructed, and immediately showed my work to Martin Sumers, he liked it and purchased the "Nature Morte" portfolio. When I returned to Deer Park and told Shirley that the portfolio sold, she was happy for me, like her own child, and celebrated baking meatloaf for dinner. Shirley's smile at that time and the enormousness of that meatloaf cannot be forgotten, even to this very day. Since I had achieved my purpose in New York, I told Dan that I will go to the next destination Boston Massachusetts. Dan told me that a print fair is being held in Boston and that he wanted to go too, and that he would take me there by car. Early the next morning, Dan drove to the north with his moss green colored Subaru that I will never forget, and we got at Boston in the afternoon. There were 50 or 60 booths lined up in the venue as big as the gymnasium, and it was lively. I was surprised to know that there was such a large number of customers that existed seeking print works, but I had always hoped someday, secretly, that I would be able to show my works at such a fair. I parted with Dan, and I found an apartment in Beacon Street where Tracie Ewing and her boyfriend John live, Tracie is a friend of Judith Lockie, I met her when she came to London which was the prior year, at that time in my life. Tracie was a nurse working in a hospital in the city, an active woman who likes art and taking photos in her free time. I cannot forget a memory of when Tracie drove me to Salem one weekend, which was famous for its witch hunts in the past. When the tramcars were running in Boston, I saw a printmaking workshop right next to the stop, so I tried visit. 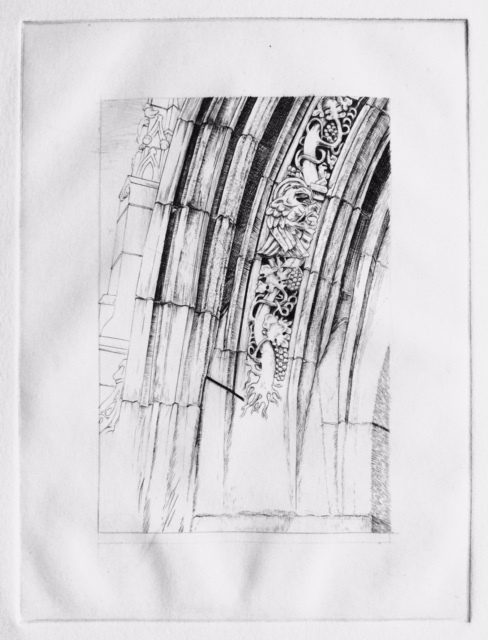 It was called Experimental Etching Studio, I met Deborah Cornell and became a member for a short period of time, and produced the engraving, "Emanuel Episcopal Church," which was the first American landscape engraving that I produced in 1979. 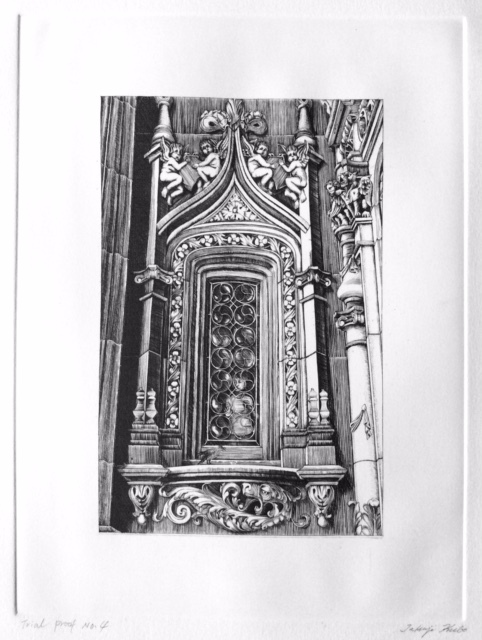 Boston is not so big but it is a fascinating city that makes you feel like you are in history, and I had a great time visiting Boston Museum and making a demonstration of engravings at the library of Boston University. I stayed in Boston for two weeks and thought that I would go on to the next destination, so I told Tracie that I want go to Washington D.C. by Greyhound. Tracie told me "Are You Crazy!” In the evening of the following day, Tracie returned home after finishing her work, and she called me, saying "This is my present for you” and passed me an envelope. When I opened it, there was a one-way flight ticket to Washington D.C. I felt the “Yankee girlly” kindness, held secretly in Tracie’s mind for the first time in my life. On the plane the next day, I sat down in my airplane seat of the early morning flight that flew to the south, bearing my tears for her kindness. I got at Washington, D.C. on the morning of October 15th, 1979, and two more unexpected events were waiting for me. For the time being, I went to the high-ranking Smithsonian Freer Gallery of Art where the collection of oriental art is substantial. When I tried to go out of the gallery that was filled with Japanese art collections such as the famous James Whistler's Peacock Room and Houitsu Sakai’s scroll paintings that I viewed with awe and wonder, a young lady at the corridor asked me “Are you Japanese?” I answered, “Yes I am,” and she told me that “I am Ann Yonemura a Japanese-American curator of this museum's art gallery;” and then she asked me, “What you are doing here?” I answered, “I am a printmaker and I was living in London and traveling around the US and then returning to Japan.” Ann stated that she would like to see my work, so I showed her the Nature Morte engravings. She stated she liked my works, so we exchanged our respective addresses in hopes of a reunion. I left the museum with a thanking for the casual encounter. Next I went to Georgetown Graphic Inc, which was on the Hildebrand list and met Lee Silverstein. When I showed my work to Lee, he told me that he wanted to purchase the whole editions of my work. He told me that “When you return to Japan, print the edition and send the work to me,” and he handed me a check. How gentle and kind a person Lee was. 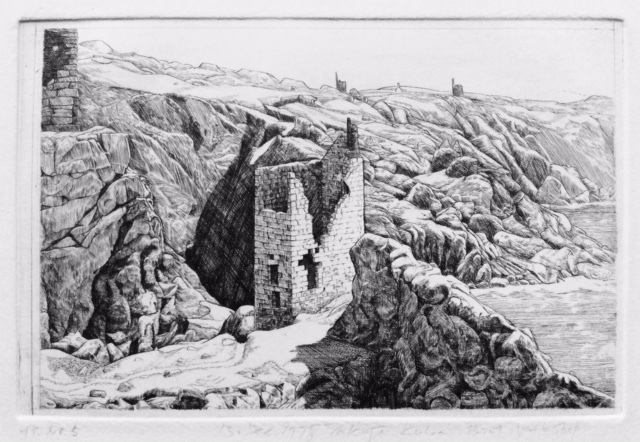 When I returned to Japan, I printed the work and sent it to Lee, it was "Cornwall" which I made in London, in 1978. When I visited the gallery, Lee seemed to be looking for works to be distributed to members of the print club, I learned later that it was good timing. Cornwall is located in the southwest part of the UK, and in the past there were many brick made buildings of mining remains on the seaside in the area where the mining industry was popular. It was a memorable countryside where we stayed for two weeks camped at the ranch of the friend in Penzance on summer vacation with friends of the Wapping Studio. I received an unexpected business communication that made me happy, and I took an Amtrak Train back to New York. Then I bought a flight ticket for Los Angeles at the Pan Am office of JFK Airport and flew west by a night flight. After I arrived at LAX airport, I visited Little Tokyo and spent some time exploring the city. Then, I went to the bus terminal and bought a ticket for Portland, Oregon, at my favorite, a Greyhound office. In the 1960’s when I was a junior high school student, I liked TV programs such as "Route 66" and "Surfside 7" and I often watched it, there were a lot of scenes where people were traveling on a Greyhound bus. When I grew up, I was dreaming that one day I would like to do such a journey taking a truck case. I finally got excited because I would be able to realize this dream by taking one along the West Coast that day. The bus runs all the way up to the cotton fields in California and occasionally stops at bus terminals in rural towns, in places where I did not know the names and then towards north, but I could not get to the destination very easily. It took almost 26 hours to get to Portland, Oregon. I was able to understand the reason why Tracie had told me, "Are You Crazy," just four days ago. The distance from Los Angeles to Portland is the same as from Kagoshima to Aomori in Japan, about 2,000 Kilometers, that first bus trip made me realize the size of the American continent. If I would have flown from New York to San Francisco, I could have gone to Oregon in half of the time; but never mind, I was able to ride plenty on the Greyhound where I was able to admired the lad and towns on the way. At the bus terminal, Timberly Newgent, whom had worked with me at the Print Workshop, came to pick me up with her boyfriend, Greg. When Timberly came to the Print Workshop, I was looking after her, as she was unfamiliar with London. When she returned to California, she invited me to stop in Portland. They lived in a quiet town called Forest Grove, a bit east of Portland, and they were both students of the Oregon University Art Department. We went hiking in the fields and mountains, and drove to the sea to spend two weeks enjoying nature in California. Then I visited San Francisco on Greyhound and stayed for a week. After this, I arrived at Haneda Airport on a China Airlines flight on November 18, 1979. After leaving and traveling form Haneda in November 1976, my journey of wandering for about three years had ended.